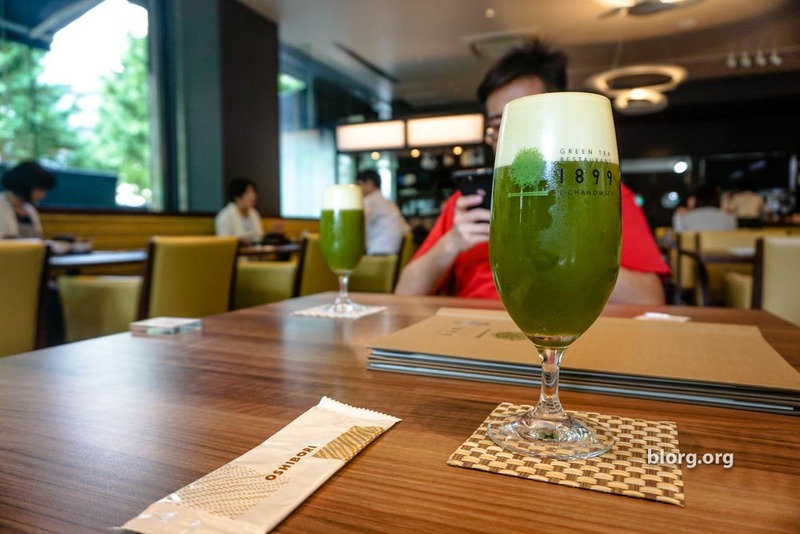 The only place that serves green tea beer is at 1899 Ochanomizu in Tokyo. It tastes very bitter along the lines of a concentrated green tea and an IPA. Served as a half pint, I struggled to finish this due to the bitterness. I forgot how I heard about 1899 Ochanomizu, but I left a note on my Google Calendar to check this place out while in Japan. At least I think I did that…unless GoogleAds has gotten to the next level of advertising. In any case, they specialize in a green tea beer that you can’t get anywhere else (patent pending). Southwest from Akihabara station, it’s about a 10 minute walk away from all the crowds into a quieter part of town. I didn’t do any research on the place and assumed it was just a beer garden, but it seemed like a fancy place upon entering. Once through the door, the hostess came out with a warm greeting and lead us to a table. I was there with my buddy Andy. She left us two menus and we began looking for the beer page. It was a full on cafe/restaurant so it took some time to make it to the beer page. I went with the 1899 MATCHA beer. After struggling with the menu for a few minutes, Andy selected the same. He was struggling to read the menu for awhile until we figured out we had different menus. I picked up the English menu from the table and he picked up the Japanese menu. So a heads up for you English-only readers, ask for the English menu. Okay, back to the beer. The presentation of the beer looked great! I was disappointed that the size of the beer wasn’t a full pint. It seemed like it was a half pint (8 oz.). For 720JPY, I was expecting a full pint. But, it ended up working out okay. The beer was awful and hard to drink. Extremely bitter/concentrated green tea with hints of an IPA. There were small green clumps in the beer which I assumed was from the green tea. ⟵VR Zone Shinjuku: Dragon Ball VR Battle!